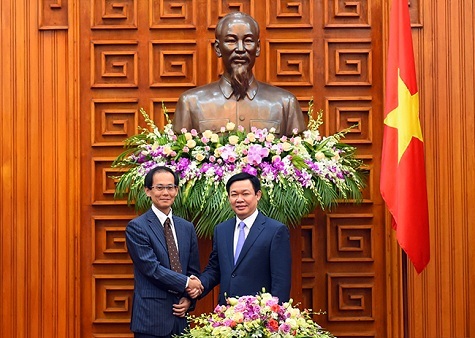 Deputy PM Vuong Dinh Hue hailed the Japan International Cooperation Agency (JICA)’s researches into State-owned enterprises (SOEs) and banking restructuring, regarding them as crucial assistance and policy consultancy for the Vietnamese Government. Deputy PM Vuong Dinh Hue made that statement at his reception for Vice President of JICA Kenichi Tomiyoshi on June 16. The two sides lauded the development in the two nations’ extensive Strategic Partnership. Deputy PM Hue asked relevant ministries and agencies to closely cooperate with the JICA to complete SOEs and banking restructuring in the context that Viet Nam has gained a number of achievements in socio-economic development. He expected that with Viet Nam’s determination and efforts and assistance from Japan, Viet Nam will successfully realize economic restructuring and head to fast and sustainable development. Mr. Kenichi Tomioyshi and Japanese professionals presented fundamental and breakthrough proposals for reforming the SOEs, dealing with bad debt and shortcomings of Vietnamese commercial banks in the 2016-2020 phase. Deputy PM Hue thanked the JICA for supporting Viet Nam in infrastructure for industrialization and modernization, contributing to the two nations’ relations as well as boosting the two economies in terms of development strategy, production capacity, training and human resources development.